I ordered my new harness, a rather stylish 'granite' pairs harness with Coblenz collars. Granite is leather-look biothane wrapping strong webbing. Coblenz collars are renowned for their efficiency and build. All of this is refreshingly affordable compared to Scandinavian and leather harness. 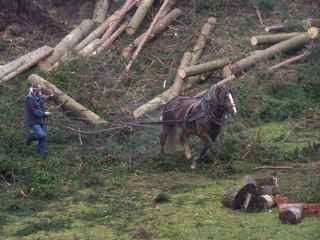 I ordered two extra 'hold backs', what we call britching, for each horse. I cut and shortened the traces and re-attached them directly to the pulling ring. As I intended to keep the harness intact I dispensed with my usual tug hooks and attached my adjustable tugs to the posts on the hames. We have now thoroughly tested the harness and it works like a dream. I follow with some photographs to illustrate the text. The harness on Salva. The tugs are chain and, therefore, adjustable. Note that a link has been dropped to allow adjustment. Spare links will be cut off once I am happy with the adjustment. This adjustment can change over time as the collar 'beds in'. 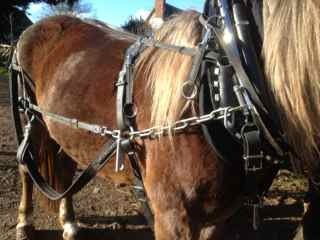 One pair of the holdbacks or britching attaches to the pulling ring and the second pair of hold backs go under the belly to the D ring on the martingale for working as a pair with a pole. The traces are permanently attached and, as they are webbing, they are light and do not 'clash' with the shafts. The harness is always ready for work whether with pairs, singles, a pole and shafts, single or double, without any changes or alterations. A detail of how the two hold backs are attached to the britching. 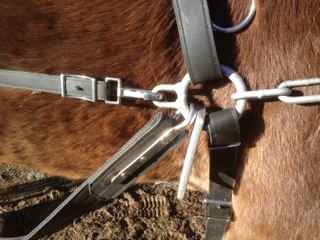 The upper goes to the pulling ring and the lower under the belly to the martingale. Note the extra padding with a britching pad and the trace carrier. 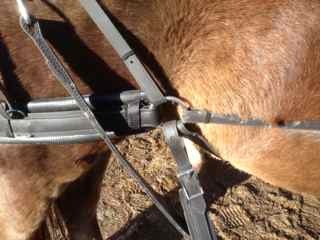 The traces clip up to a hook on the harness and are out of the way. A detail of the pulling ring. Tug, back band, belly band and britching attached as usual. Traces fixed above pulling bar and chain tugs going forward to the collar. The traces are above the pulling bar so that when in use the pulling bar can hang freely. When the shafts are used the pulling bar sits where the traces are now, fitting comfortably with the traces. 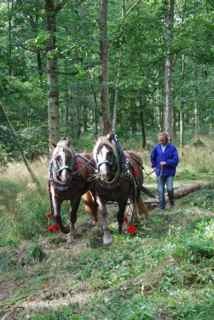 Salva and Agua driven by Mike Paddock as a pair with young Glyndwr hitched alongside Agua. 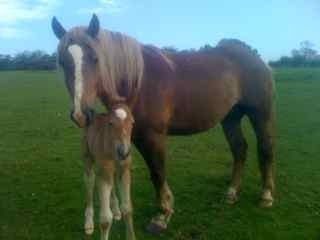 Agua gave birth on 4th May 2013 to a healthy colt foal. 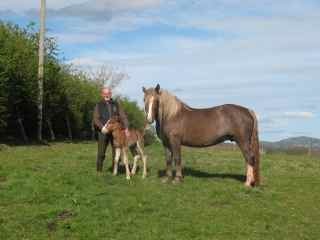 He is named 'Glyndwr' to reflect my long and happy association with Wales, to continue the water theme with his and his mother's names and because he is of the 'G' line of Silesian Noriker stallions. Salva gave birth on 19th May 2013 to a colt foal. He is named 'Gawain'. Tragically, we found him dead in the field on the morning of the 20th May. Early on the morning of 5th September 2012, Agua and Salva were unboxed and shown their new quarters. They seem happy and quickly settled in (with a bit of squealing, mainly from Jacob!) and are doing well. 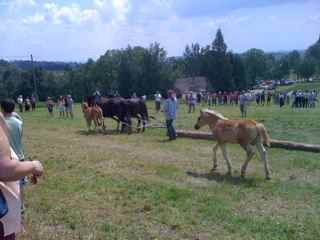 In 2007 a BHL Study Tour to the Czech Republic was organised. 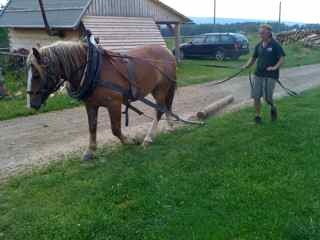 Our first visit to a professional was to Josef Svoboda at the Hradcany Centre just outside the village of Pecin. The visit proved to be the highlight of the tour and left a deep impression on me and others. I have since met Josef on a number of occasions. 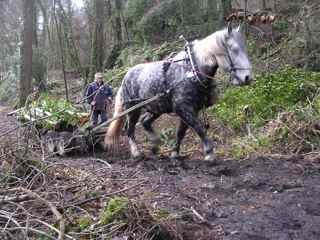 He has visited us at home in 2009, working with me on several sites and gaining an insight into British horse logging. I have met him at Detmold where he performed creditably against some of the best horse men and women in Europe. After long discussions he was approved as a placement provider for the Charitable Trust apprenticeship scheme and Mike Paddock spent a month with him in the second year of his apprenticeship (in 2010); I flew out with Mike to make the introductions and to meet with Josef again. He visited us again when we hosted the FECTU meeting in 2010 and I have now been out once more, in early June 2011, to enjoy the peace of Hradcany and Josef’s company. The purpose of my visit? A social call? An exchange of professional views? All of these, of course, but the main purpose was of a greater significance for me and my business. 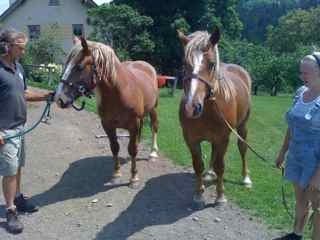 'Willpower' and 'Sunflower', Silesian Noriker mares with Josef in the Czech Republic, 2010. They are mother and daughter. 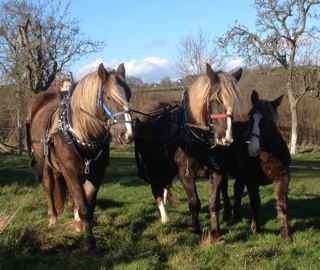 I can now clarify that reply and say that my next horses will be a pair of Silesian Noriker mares called ‘Agua’ and ‘Salva'. They are both currently two years old (June 2011) and started in training. They are daughters of Josef’s deeply impressive stallion, ‘Brynet’ and out of two of his best mares, ‘Willpower’ and ‘Sunflower’. 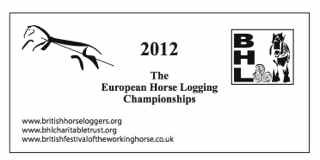 They will be delivered, carrying foals to another carefully selected stallion, in September 2012. 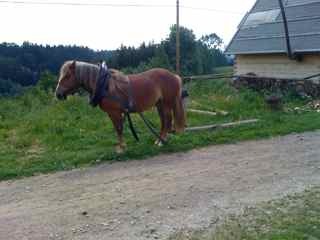 I had discussed buying horses from Josef before and we had agreed in principle. What we have now done is to make the selection and shake hands on the deal. Daniella with 'Agua' on her right and 'Salva' on her left. This is no ordinary purchase but marks the beginning of a collaboration between us to promote the breed outside the Czech Republic and to arrange breeding and sales in the UK. 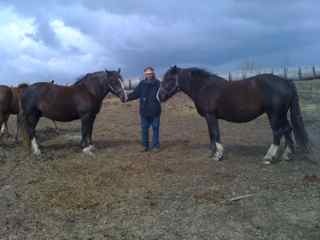 Josef breeds and trains exceptional horses and sets a very high standard for himself, his horses and anyone who works with him. 'Shunting' a log in May 2012; the training goes on. 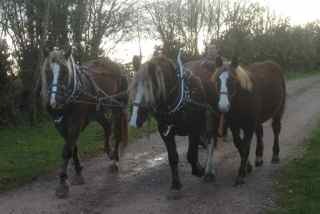 As to the short visit; we travelled with four mares and their 2 month old foals some miles to a scything competition. 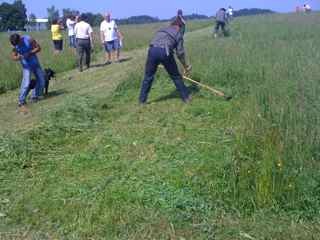 The scythes were straight handled and the skills shown were outstanding. 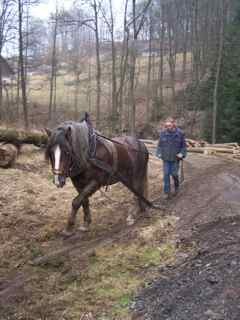 Around fifteen 10m x 10m plots of hay were cut and Josef did a demonstration of his skills and the horses abilities with one of the pairs of mares hitched to a large log while the other two were ridden and jumped over the log that Josef was pulling. 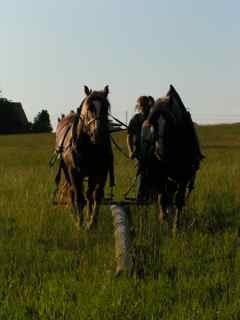 Two mares pulled the cart there and the other two pulled it back. When not pulling the cart they were ridden. The foals ran loose. I would say alongside but it was much free-er than that, and they had a ball, showing no fear of the cart, the people and little respect for some strawberry plants growing by one of the houses we passed. 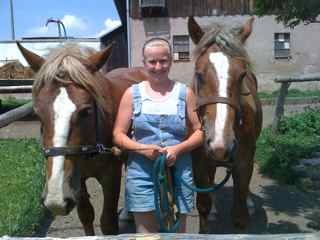 Josef’s wife Jindriska is a very accomplished horse trainer and worker and both of Josef’s twin daughters have enormous horse skills. Daniella will be principally responsible for bringing my two on and I look forward to the results. So, why have I settled on this breed and why am I trying to promote them? Over the years I have travelled fairly widely and seen many very professional horse men and women and been impressed by very many horses. I have never been impressed more than at Hradcany! 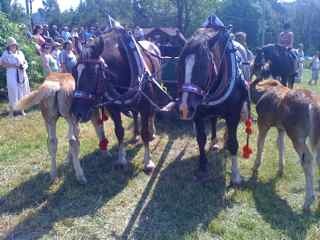 The Silesian Noriker breed was established in the early 1900's. 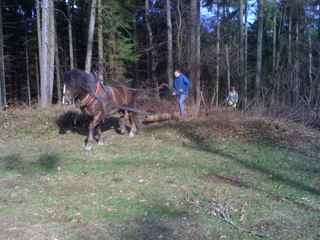 A cross between the Austrian Noriker, the Przedswit (a native Czech carriage horse similar to the Kladruber) with some Norfolk Trotter blood. The foundation sire was 'Bravo (1920)' and 'Brynet' is a direct descendant (the 'B' line) well known for its docility, working spirit and easy training. The stallions and the mares are carefully selected, trained to a very high standard and bred pure. Any substandard stock is not bred from; so unlike here in the UK! The breed ideal is around 16hh, powerful and full of spirit, agile and active with a keen and eager temperament, easy to train and a very efficient worker. Largely unknown in the UK, I hope my young team will generate an interest in the breed. Mares and geldings will be available as part trained three year olds in the future.